To get your Labor Day dance on, while sucking on a chicken bone – we recruited and are excited to rock-out with the Queen Bee of the turntables – DJ Ultraviolet – for Wing King 5!! What, what!?! 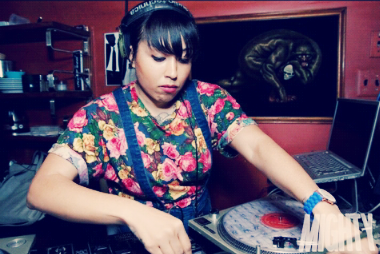 Leader of her our digital record label, Bee Eater Records, this skilled female DJ has been killing the Philly music scene for years – notably her party (with the Legendary Monie Love) called Ladies Love Hip Hop. Sharing the decks and stage with Philly hard-hitters such as DJ Scratch, 9th Wonder, Questlove, Jean Grae, Spinderella, Large Professor, Rich Medina and Q-Tip to name a few, this lady friend of ours knows how to get you moving and grooving. Trust us, this woman knows her music and knows how to get that foot of yours tapping. So prep your bellies – but mostly prep your moves, because we are going to rock-out, Labor Day-style with the lovely, talented and swaggerific DJ UV! This entry was posted on Sunday, August 25th, 2013 at 2:40 pm	and posted in DJ, Wing King. You can follow any responses to this entry through the RSS 2.0 feed.